My What Runs U partner, Kris, has offered a fun, creative recipe that’s easy and pretty versatile and geared for those following a lean, lower carb, high protein diet. He trains himself and others for body building competitions and overall bigger guns. Kris has been making some great recipes that he shares with me via iPhone. 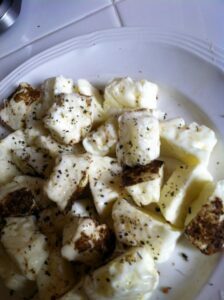 That’s the great thing about being a food blogger: Your friends send you pictures of their food that they’ve created. I love it! Food can be such a great outlet for creativity! Not only that, but it can help you learn how to properly feed your body- especially if you do some strenuous workouts. Anyway, today’s What Runs U comes from a great personal trainer and friend, with a step-by-step lesson in an easy egg dish using Lana’s Egg Whites. 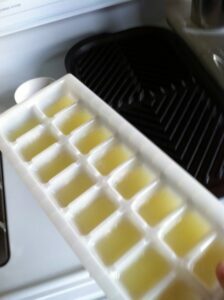 Gather up an empty and clean ice tray. 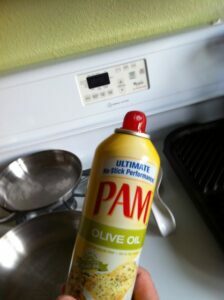 Spray it with a little olive oil spray. 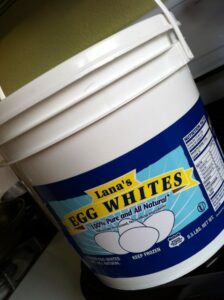 Get your egg whites from Lana’s Egg Whites (great company hosting 100% pure egg whites!). 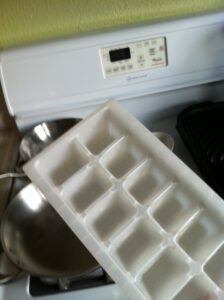 Fill your ice tray to 1/2 – 3/4 of the way full with the egg whites. 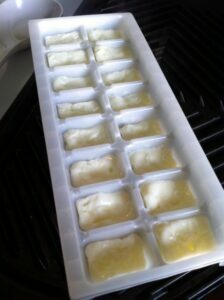 Place egg whites in trays into the microwave and nuke for 3 minutes (keep in mind, times may vary slightly). Wa-la! Now that the egg whites are fully cooked, you can choose to eat them as is or throw in some fun ingredients. Additionally, you could mix spices or any other ingredients into the egg whites before microwaving them for a little more infused flavor. Toss with a little salt, pepper, and whatever seasonings you’d like. 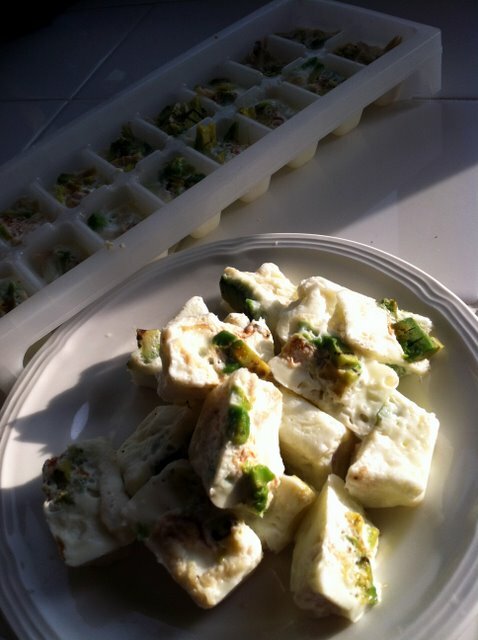 Kris’ favorite is egg poppers mixed with avocado and turkey. Thanks, Kris! I honestly never would have thought of doing something like this. Is pretty creative and super easy. Especially if you’re busy or don’t want to dirty a pan. Get more fun fitness tips and healthy-body info with Monday’s What Runs U posts! Submit your questions, comments, and recipes for your spot on Monday’s healthy topics. And since we’re gearing up for the fast-coming holidays, check out what you can give yourself in the 12 Days of Christmas -One post you do not want to miss. Tomorrow we’re back with a fully-charged, calorie burning workout. It’s a hard one, be ready! Thanks guys, always fun to find cool and easy ways to eat healthy. Remember we can all help oneanother so don’t stop sharing. 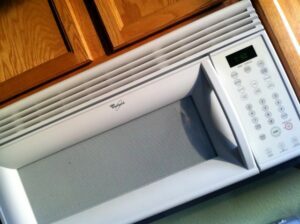 I had a feeling you’d get a plastic in the microwave comment….whatever. There are way worse toxins out there to worry about. But, I have seen this done poached egg style – put in muffin tins, and then in a 9×12 pan filled with water and bake for 5 min. I like this idea WAY better. So easy!! I eat hard boiled eggs all the time, but I hate the yolks (I only eat my yolk runny). like your last recipe all i say to say is: YUM. ! great idea but I’ll cook them in mini muffin tins – never put plastic in the microwave!! Hahahah now that is a clever idea!! I freakin’ love it! My friends send me pics of their food too – it’s so funny and I love it! Poppers are so cute! I’ve done something similar before but added the “mix-ins” and then baked them. Love having breakfast ready to go! I would have never thought of that! It would be great to make eggs quick and easy for breakfast burritos.